I'm sure everyone out there religiously takes oil samples at every change so you'll know if you have a drop of coolant in your oil, right? Yeah, right! So, here are a couple more likely scenarios: you go to change your oil and find it's turned to milk, or you top off your oil and find goopy snot under the fill cap. Or, worst of all, you park your truck for the night and come out in the morning to find it won't roll over. What's going on you ask? Well, there's a good chance you developed a pinhole coolant leak in your liner. Sure, there may be something else going on (check out another blog on cylinder liner failures if you're interested), but today's topic is pitted liners. How does this happen, you ask? Why me? Cylinder liners are made of iron. A running diesel engine causes tiny bubbles to form in the coolant around a liner. When the bubbles pop, they eat away at the soft rust (See figures 1 & 2 below). Repeat steps 3&4 about a billion times and ta-da! You now have a pinhole. Coolant leaks through the hole and runs down the inside of the liner into your oil pan. It also can spray into the cylinder and sit on top of the piston. Cylinder liners are made of iron (FE). When the engine is running, the pistons hit the liner and cause a high frequency vibration. As the liner vibrates it moves outwards towards the coolant and then back away from it. This causes vapor bubbles to form as the liner moves away. When the liner moves outwards again, it then compresses and implodes these bubbles. The implosion will erode small holes in the liner wall. 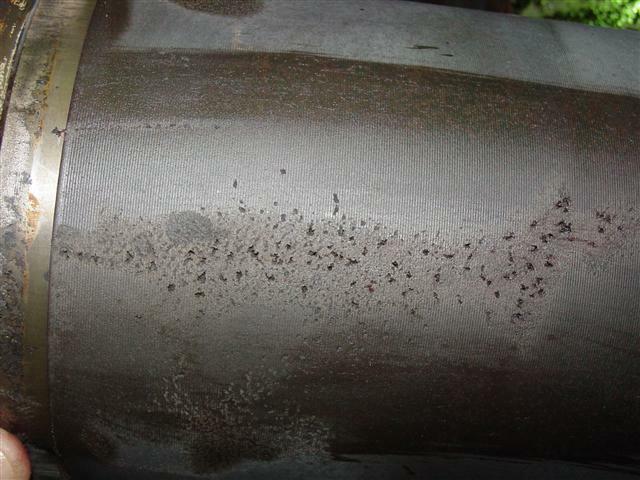 This process is called Cavitation Corrosion or Erosion. 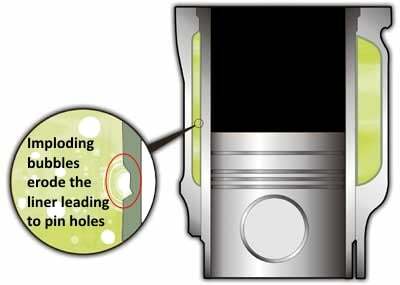 The Cavitation Corrosion / Erosion can be found anywhere that coolant contacts the liner. It is usually found most heavily on the side of the liner that is contacted by the piston during the firing stroke. If this happens to you, it's probably time to consider new liners. Take a look at our selection to find the right cylinder liner for your engine. There are too many factors to consider to determine how long it may take to erode a liner. I know of cases where it's happened in less than 300,000 miles. Some estimates say it can in less than 500 hours under severe conditions. A couple of things can help prevent liner pitting. Far and away the best method is to use a diesel specific coolant that contains a liner protective additive. You can also buy liner protective additive separately and add it to standard coolant. You may have heard liner protective additive called by a few different names. Supplemental Coolant Additive (SCA) or Diesel Coolant Additive (DCA) are a couple of the more popular. What SCA or DCA does is coat the liners with a protective coating. This helps to prevent the liner from rusting and it also transforms rust into FE3O5. FE3O5 is very hard compared to soft rust, and protects against the imploding bubbles. If the concentration of DCA or SCA is correct to the amount of coolant, it will continue to re-coat the liners further preventing pitting. Be careful, however, as too much additive can cause problems such as water pump seals leaks. Several additive manufacturers offer test strips to help determine the level of additive in a system. They also provide recommendations on maintaining the correct level. Plumbing the system to prevent hot spots. The hotter the coolant the easier the formation of vapor bubbles. Prevent air leaks in the cooling system. The less air in the coolant, the more difficult it is for vapor bubbles to form. If you're experiencing liner cavitation, we can help! Request a quote online or call 844-215-3406 to talk with one of our certified techs. We'll help you find the right part for your engine!